The origins of the Queen Mary’s Needlework Guild can be traced back to 1882 with the formation by Lady Wolverton of a small sewing guild. This was at the request of the Matron of an orphanage in Dorset who asked for the provision of garments for each child in her care. The guild (known as the London Needlework Guild) grew and attracted the attention of Princess Mary Adelaide, Duchess of Teck, who became its Patron. On her death in 1897, her daughter, the future Queen of England, took over her patronage until 1953. On August 8th 1914, amid great fanfare, the organisation was re-named the Queen Mary’s Needlework Guild. It was launched as a means for women, who were as deeply stirred by the war as men, to make a useful and vital contribution to the war effort. Queen Mary has issued an appeal to all the Presidents of the Needlework Guilds throughout the British Isles to organise a large collection of garments for those who will suffer on account of the war. As stated on the Queen Mary’s Clothing Guild web site the work of the QMNG was twofold – to collect, sort and redistribute extra clothing items to the frontline troops and also to organise the production of various cloth items as required by the War Office. The items produced by the QMNG were diverse and included surgical bandages, tent panels, respirators as well as knitted ‘comforts’ for the troops. These would be distributed to the local regiments, troops on the front-line and to hospitals. Knitted comforts included those additional but necessary items that were not regular issue such as additional socks, mitts, mufflers, caps, belts, and so on”. After the launch, the Guild was criticised. It was considered that an army of women making clothes and other items on a voluntary basis could lead to a loss of jobs. With the onset of war the markets for some goods had collapsed and unemployment increased. It was thought by some that the Guild posed a threat to jobs, particularly in the textile industry. Many newspapers carried a response from the Queen which answered this criticism. The following appeared in the Manchester Courier & Lancashire General Advertiser on August 22nd 1915: “Queen Mary’s Needlework Guild has received representations that the provision of garments by voluntary labour may have the effect of depriving from employment work people who have been engaged for wages in the making of garments for contractors to the Government. It is pointed out that a very large portion of garments collected by the Guild consists of garments for soldiers, sailors, sick, wounded, and families who may be in distress – garments that would not, in any case, be purchased by the Government, and if not made by voluntary labour would not be available at all. Her Majesty is most anxious that the work of the Guild should not have any harmful effect such as suggested and urges the making of such garments as would not be provided by the Government. All kinds of garments will be required in winter, if there is exceptional distress and it is pointed out that garments purchased by ladies and sent to the Guild will be as acceptable as if made by them, and this would have the additional advantage of promoting the employment of women engaged in their manufacture”. The Queen placed an order for 75,000 body belts to be distributed as Christmas gifts to the troops and also encouraged women to purchase items to donate to the Guild – thus supporting industry. Items that were to be made were those that would not have been provided by the Government. The Guild provided an opportunity for upper class women to contribute to the war effort and their organisational skills were put to the test as sewing groups were set up all over the country. At Biddulph it was Miss Heath of the Grange who took control financially as treasurer and organised the setting up of the working parties, the purchase of materials and the despatch of the finished items. By the end of August 1914 sewing parties had been formed and were arranged at The Rectory, Biddulph Moor on Mondays, Biddulph Gymnasium, Wednesdays (2.30pm until 4.30pm), the Moor House on Wednesdays (3.00pm until 5.00pm) and at Biddulph Grange on Thursdays (5.00pm until 7.00pm). Local press indicated that over 100 workers were engaged. A sum of thirteen guineas was subscribed at the first meeting and the material purchased initially kept the ladies busy. However, fresh supplies were soon needed and funds urgently required. All contributions were sent to Biddulph Grange. The Staffordshire Weekly Sentinel of September 26th reported on the first instalment of work that was sent to the Red Cross: “As the outcome of the various working parties organised by Miss Heath, Biddulph Grange, in connection with the Queen Mary’s Needlework Guild, a first instalment of work has been sent to the Red Cross Society as follows: Twenty-two pairs socks, 22 night shirts, 19 day shirts, 3 pairs pyjamas, and 1 bed jacket. The following is the subscription list up to date: Biddulph Mothers’ Meetings, £5; Biddulph Women’s Unionist Association, £3; Mrs. George Harding, £2 2s; Mrs. Sword £2 2s; Miss Harding, £2 2s; Miss Bird, £2 2s; Miss Bird, £2 2s; Miss Heath, £2 2s; Mr. Thos. Cottrell, £2 2s; per Mrs. Sword, £2 2s; Mrs. R.S. Harding, £2; Mrs. Craig, £2; Miss Boullen, £1 1s; Mrs. C.G. Myott, £1 1s; Mrs. J.A. Lees; £1 1s; Mrs. George Gibson, £1 1s; Mrs. J.H. Cole, £1; per Mrs. Sword, £1; Miss Heath (London), £1; Mrs. S. Gibson, 10s 6d; Mr. Deakin, 10s; Rev. R. Bateman, 10s; Mrs. Bateman, 10s; Mrs. Appleton, 5s 6d; Mrs. Dean, 5s 6d; Mr. R. Williams, 5s; Mrs. Butterworth, 5s; Mrs. W. Milnes, 5s; Mrs. Lawton, 5s; Miss Brundrett, 5s; Mrs. Sherratt, 5s; Mrs. Warren, 5s; Mrs. Close, 5s; Mrs. G. Clayton, 5s; Mrs. Dean, 2s 6d; Miss M. Thompson, 2s 6d; Mrs. Brindley, 2s 6d; Mrs. Howarth, 2s; Mrs. G.H.Gaskell, 2s; Mrs. Stanway, 2s; Mrs. Graham, 2s; Mrs. Pointon, 2s; Mrs. Buxton, 2s; Miss Myott, 1s; Miss A. Taylor, 1s; Mrs. Buxton, 1s; total, £39 .17s”. Gifts of material had also been received and another batch of items awaited despatch. This included: “30 shirts, 15 nightshirts, 4 pairs pyjamas, 70 pairs of socks, 30 children & women’s garments, pillow cases, bed jackets and cholera belts”. The Chronicle also reported on this first instalment and stated that: “A generous subscription list was promptly forth coming, together with a good supply of material, and a willing army of over 100 workers”. Reviews of the work of the Biddulph Guild appeared monthly in the local press. In October it was reported that a good response had led to five and a half dozen pairs of socks sent to Devonshire House. In November, the Staffordshire Weekly Sentinel requested more donations: “More subscriptions needed by the Biddulph Branch. There is an appreciable continuation each week in the response of Biddulph to the needs of our soldiers and sailors either in gifts of garments and so on and the Queen Mary’s Needlework Guild, or subscriptions to the local guild for the purchase of material. Excellent though the display of loyalty has undoubtedly been the need for it is increasingly great and if the splendid work of the Biddulph Working Parties is to be maintained, more subscriptions must come in at once. Miss Heath, Biddulph Grange, who has been mainly responsible for the organisation of the work in Biddulph wishes to make an urgent appeal for further funds to enable her to purchase more material”. The December’s issue of St. Lawrence Parish Magazine reported that subscriptions to the local group had reached £55 5s. Items produced included: 209 pairs of socks, 181 shirts, 47 nightshirts, 11 pairs of pyjamas, 71 knitted garments, 75 children’s garments, 62 pillow cases, 14 bed jackets. Fund raising for the sewing groups became the focus for many local organisations. On December 16th at the Church Hall, the Mothers’ Meeting Groups held their annual sale of work followed by a concert in the evening. Proceeds went to the QMNG. The Parish Magazine, commenting on the event, stated that the mothers sat down to a sumptuous tea which included mince pies, sausage rolls “and even oranges”. The Guild continued to produce garments at an astonishing rate. In December the Staffordshire Weekly Sentinel praised the “patriotic efforts of the Biddulph ladies in supplying warm, useful garments for our soldiers, sailors and others needing them, have been splendidly maintained since the Biddulph working parties were first organised. ....Substantial parcels have been despatched to various depots, and every week contributions in money and garments have been freely sent in to the local guild”. Work halted over the Christmas period, however, Miss Heath “will be very glad to receive and send up to the Red Cross Society, or any other society, garments anyone may make and forward to her”. St. Lawrence Parish Magazine, January 1915, reported on the efforts of the QMNG: “We are glad to hear that, apart from the men still at Butterton, every soldier who has left the parish in his Country’s Service will receive from the Biddulph Needlework Guild a Xmas present in the shape of a shirt. In addition to this, gifts of clothing and toys have been handed by ladies in the Parish to the children of those soldiers still in training. The idea is to supplement the presents which the American Santa Claus ship has brought across the Atlantic for the children of men serving at the front”. Fund raising for materials continued and there was a Flag Soiree on January 13th at the Church Hall by the members of the Knypersley Hall Sewing Classes. Proceeds went to provide materials for knitting socks and making shirts for our brave defenders. 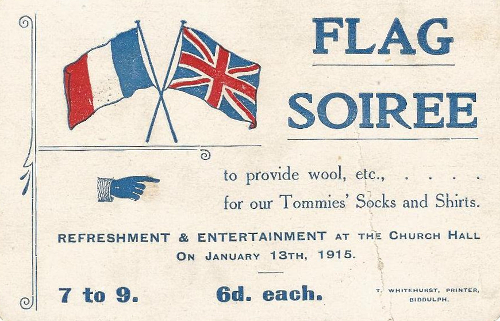 The March parish magazine reported that the event raised £8 which was spent on material that is “being made up at a rapid rate into socks and shirts”. A summary of the accounts was printed in January 1915 in which it was stated that subscriptions so far had amounted to £63 7s 6d. Expenditure, which included £60 4s for material, £1 for cleaning the gymnasium and 9s 2d for postage left a balance of £1 14s 4d. A list of garments made included: 240 pairs of socks, 217 shirts, 47 nightshirts, 13 pairs of pyjamas, 13 helmets, 6 cardigans, 45 belts, 5 scarves, 14 bed jackets, 62 pillow cases, 6 vests, 9 pairs of cuffs, 119 children’s garments and a box of bandages. Donations included: 264 yards of material, 21lb of wool, 172 pairs of socks, 73 belts, 56 scarves, 23 pairs of mittens, 16 shirts, 3 nightdresses, 11 helmets, 2 pillow cases, 23 children garments, a rug and a dressing gown. Miss Heath “wishes to thank all who have helped to make the Guild successful and she hopes at a later date to be able to resume the organization. In the meantime, she will be glad to receive any garments and will forward them to one or other of the various societies”. “Although the working parties in Biddulph organised by Miss Heath in connection with the QMNG have been discontinued for a while, there is still exhibited throughout the district a most commendable generosity in responding to the call of the guild. Gifts of money have come in freely and the larger and valuable consignments of warm, useful, garments to the various depots for our soldiers and sailors, or sick and wounded and the Belgian refugees, are a striking testimony to the untiring labour of the ladies of Biddulph”. February’s Parish Magazine commented that the working parties held at the Moor House for Biddulph Park and the Hurst still produced a considerable number of garments which had been sent to Miss Heath for the QMNG. The Sentinel reported that: “The Biddulph branch of QMNG will resume work at the Gymnasium on Wednesday February 17th. Work will be given out each Wednesday between 2.30 and 4.00. At Biddulph Grange the working parties will be held every Thursday between two and six o’clock”. Fund raising also continued and in March a “Successful Patriotic Concert” took place. This was “with the object of obtaining funds to supply materials to help the Biddulph Needlework Guild in their making warm garments for our soldiers and sailors, a successful concert, arranged by the members of the Biddulph Prize Male Voice Choir, was held in the Public Hall on Saturday evening. Mr R. Heath, J.P. presided. Possibly owing to the unfavourable weather conditions there was not a large attendance but as a great many tickets had been sold, the financial result should prove an appreciable one”. By March, the items were being sent direct to the men: “Biddulph Needlework Guild. An excellent response continues to be made by the ladies of Biddulph in the work of supplying our gallant soldiers and sailors with warm garments. Parcels have been sent to the 5th North Staffordshire Regiment (now at the front), to the Buffs, to Lord Kitchener’s new Army and to the sailors of HMS Galatea”. Staffordshire Weekly Sentinel March 20th 1915. One of the last accounts of the Biddulph Needlework Guild to be found in the press appeared in the Staffordshire Weekly Sentinel of May 8th 1915: “Work discontinued for the present. The work in connection with the Biddulph Needlework Guild is to be discontinued for the present. Very excellent results have been attained by the ladies of Biddulph in their patriotic work, and Miss Heath wishes to thank all who have helped her to send so many comforts to our gallant soldiers and sailors, either by subscribing or cutting out or making up the garments. Since February the following subscriptions have been received: Eileen Butterworth 2s 6d, A friend per Nurse Joyce 2s 5d, Scholars of Gillow Heath Sunday School 12s 6d”. Various other individuals were also listed and “Proceeds of concert held by Biddulph Prize Minstrels Troupe £2 6s 3d, Proceeds of a concert held by the Junior branch of the YWCA £2 .These subscriptions with the sum of £4 17s 1d in hand, make a total of £11 11s 10 and the expenses have amounted to £11 11s 3d&rdqup;. The September Parish Magazine reported that “The QMNG and sewing groups have sent out 53 shirts, 53 pairs of socks and 72 tablets of soap”. The astonishing level of production is highlighted by adding the monthly figures of items produced up to January 1915 that appeared in the press. Totals included at least 570 pairs of socks, 84 night shirts and 282 day shirts. Other items produced included pyjamas, bed jackets, items for women and children, pillowcases, cholera belts, helmets, cardigans, scarves, vests, cuffs, pairs of mittens and bandages. It is difficult to understand the way in which production was organised. As payment had been made to the Gymnasium for cleaning, it is perhaps possible that this was where the cutting out took place. Once batches of items were cut out, perhaps volunteers were given so many items each to make up either at home or in the sewing groups. No doubt only a few of the women had a sewing machine so the making-up was likely to have been done mainly by hand. I have not been able to find out if the Guilds were issued with block patterns, especially for items such as shirts. Firstworldwar.com a vintage audio and video site, provides the words to a popular 1914 tongue twister song entitled, “Sister Susie’s Sewing Shirts” – penned by R.P. Weston with music by Herman Darewski. A version of this song sung by Jack Charman is available on the site. And sitting on the needles that she leaves upon the chairs. Our shy young sister Susie shows. Perhaps we should not underestimate the importance of this work to women. Not only did it give them an opportunity to contribute in a very practical way to the war effort but there must also have been a very emotive quality to their efforts. It must surely have helped them to feel connected to their men at the front; maybe their father, husband, brother or boyfriend. It was an activity that allowed them to share their feelings with other women in the same situation. By the end of the war the QMNG had scaled back efforts. However their work did continue as they provided clothing to the poor and to orphanages. After the death of Queen Mary, Her Majesty Queen Elizabeth The Queen Mother became the Patron and the Guild continued to flourish. In 1986 the name of the Guild was changed to “Queen Mary’s Clothing Guild”.